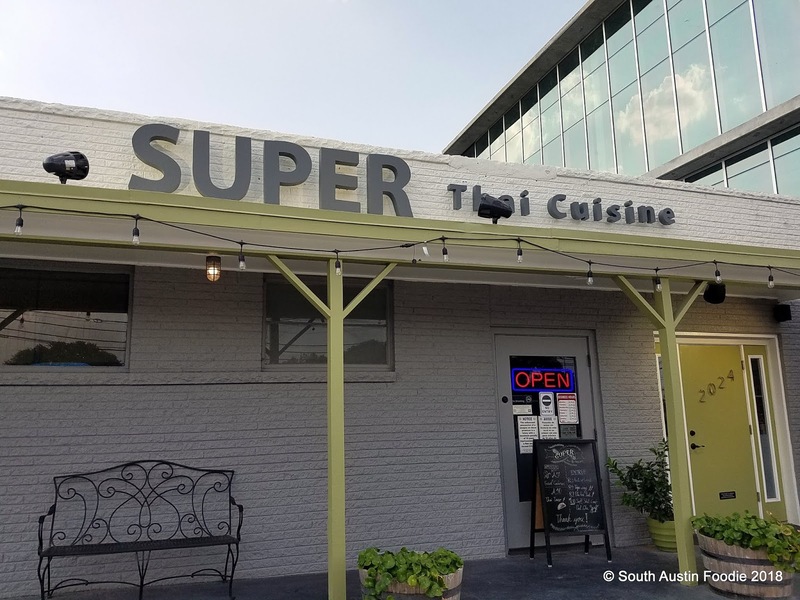 In the revolving door of restaurant openings, we now have Super Thai, formerly Krua Thai and the original Barley Swine location before it. Located at 2024 South Lamar, it is just south of the intersection of South Lamar and Hether/Mary Streets, and now literally being overshadowed by a multistory building being constructed at the corner. Krua didn't last but five months or so. 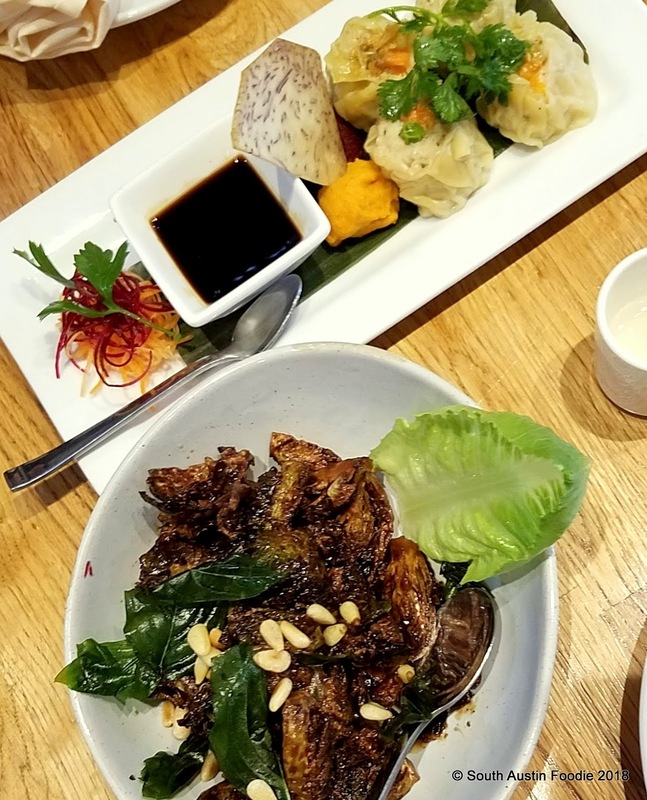 Then Sap's (former partner to Madam Mam's and now with two locations of his own) took over the Krua space stating it would be a different menu/focus than the other Sap's restaurants. So now we have Super Thai, which I hope will last (though realistically, I do wonder how long it will.....). The exterior is a bit non-descript, but I liked the interior space, especially the screen right behind the hostess stand. 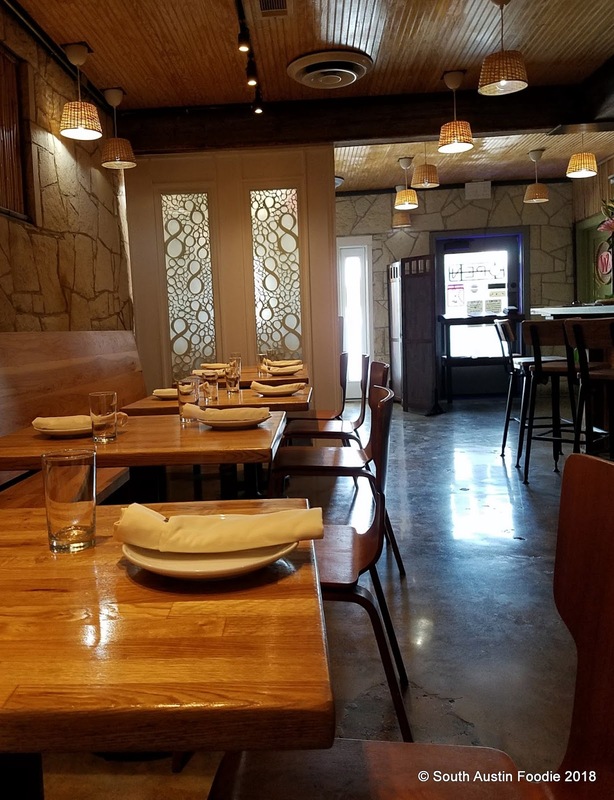 Lots of natural light at the front of the restaurant. 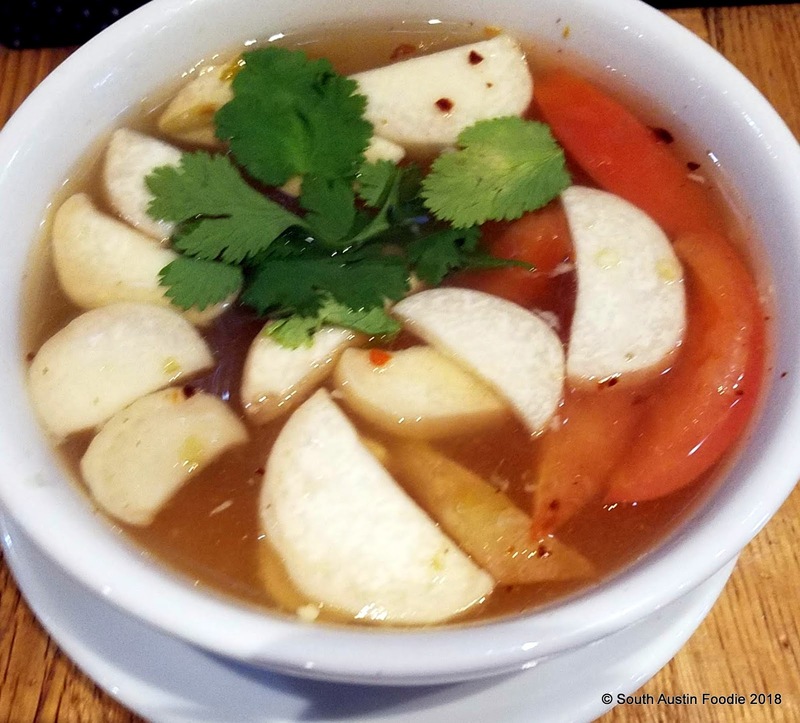 For mains, my friend ordered the Tom Yum Goong, which she asked for extra spicy. This clear-broth lemongrass infused soup was not for the faint of heart and was filled with shrimp, oyster mushrooms (the half moons in the photo are the mushroom stems), tomato and cilantro. I took a tiny taste and it did have amazing flavor, just too spicy for me! She likes it HOT and was very happy with it. 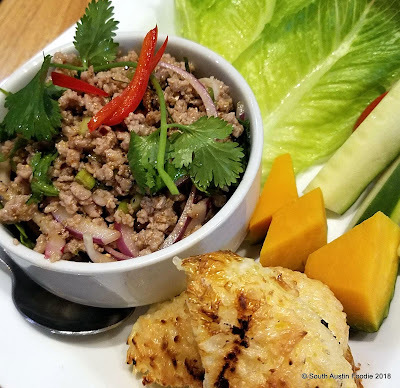 I ordered the larb moo, which is a room temperature salad so to speak, made of ground pork with chile, cilantro, mint, and toasted rice powder. This one was served with some lettuce, cucumbers, and kabocha squash on the side and a grilled rice ball/patty. Fearing the two chile pepper spice rating that was stated on the menu, I asked for it to be toned down a bit. It was still spicy, but had really good flavor to it, and the accompanying vegetables were helpful to cool down your mouth. I ate half and saved the rest for lunch the next day. 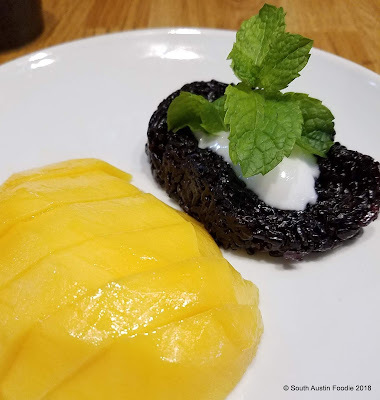 We split the mango with black sticky rice for dessert, and it was amazing! Loved the rice with coconut milk. The menu has lot of excellent sounding proteins like rack of lamb with lemongrass sauce, tamarind duck, and tiger cry with wagyu beef. I would definitely like to try some of these! I was saddened by Krua's departure, as it did seem to have a good following from the neighborhood. Super Thai did appear to have a steady stream of customers, so hopefully they survive the construction next door and become an area fixture.